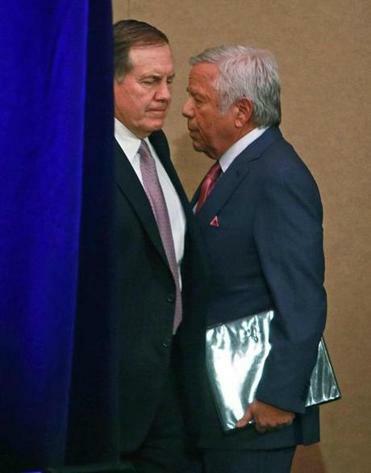 Patriots owner Robert Kraft, with coach Bill Belichick, is not at all happy with the findings of the Wells Report. For over 100 days — or over 14 weeks, as he put it — Patriots owner Robert Kraft has staunchly stood by his coach and star player in regards to L’Affaire Deflategate, and he wasn’t about to back down on Wednesday. Shortly after the long-anticipated Wells Report was sent to his organization and mere minutes after it was released online to the public, the Patriots’ media relations department sent a statement attributed to Kraft via e-mail. Indeed, as Kraft asserted at the NFL meetings in March, the extensive investigation did not turn up a true “smoking gun,” but rather a significant amount of circumstantial evidence. Kraft’s words thus far are the only reaction from a member of the Patriots; there were no statements from Bill Belichick — who is believed to have no knowledge of wrongdoing, according to the report — or from Brady, of whom the report says, “it is more probable than not” that he was at least generally aware of probable wrongdoing by equipment assistant John Jastremski and game-day attendant Jim McNally. 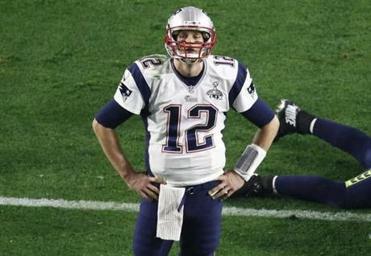 A long paper trail points squarely to a “deliberate effort to circumvent the rules.” Now Brady and the Patriots have to pay the price. But the owner did not mince words, and it’s clear he is unhappy — but in the end, Kraft said the Patriots accept the findings of the report and will accept whatever discipline is levied by the NFL. During the investigation, a research firm called Exponent, as well as a Princeton University physics professor, were employed to help look into why the Patriots’ game footballs had a reduction in PSI. The balls were gauged pregame in the warmth of the officials’ locker room; the game-time temperature for the AFC title game was 51 degrees with humidity at 71 percent, though it did get cooler as the game went on. In a fairly stunning press conference before the Patriots left for Phoenix and Super Bowl XLIX, Belichick said the Patriots took time away from their game preparation to study things such as temperature changes and the effect it could have on footballs, and the team believed the reduction in PSI was not unnatural. Wells’ scientific consultants disagreed. “The reduction in pressure of the Patriots’ game balls cannot be explained completely by basic scientific principles, such as the Ideal Gas Law, based on the circumstances and conditions likely to have been present on the day of the AFC Championship game,” the report said. ■ Kraft claimed three of the four Colts’ footballs measured at halftime were below the league-mandated minimum of 12.5 PSI. Eleven Patriots footballs and four Colts footballs were measured by two game officials at halftime, using two different gauges; the gauge used by Clete Blakeman showed lower readings for all 11 of the Patriots’ balls than the gauge used by Dryol Prioleau. The measurements credited to Prioleau for the Colts’ balls are lower than Blakeman’s, and three of the four are below the 12.5 PSI standard. ■ Kraft also takes umbrage with the report’s assertion that the Patriots failed to make McNally available for a follow-up interview, and that the team “refused even to inform McNally of our request. We believe the failure by the Patriots and its counsel to produce McNally for the requested follow-up interview violated the club’s obligations to cooperate with the investigation under the Policy on Integrity of the Game & Enforcement of League Rules,” the Wells Report said. Kraft insists that McNally was made available multiple times. There is no word yet as to if and when possible punishment will be handed out. NFL commissioner Roger Goodell said in a statement Wednesday that league vice president Troy Vincent and his team are in charge of deciding discipline.